Linebacker Jayon Brown talks about UCLA’s Pro Day and improving on his 40-yard dash. Defensive lineman Eddie Vanderdoes talks about dropping nearly 40 pounds since last summer, his health and his path to the NFL. Defensive end Takkarist McKinley talks about his recent shoulder surgery, watching Pro Day from the sideline and getting ready for the NFL Draft. 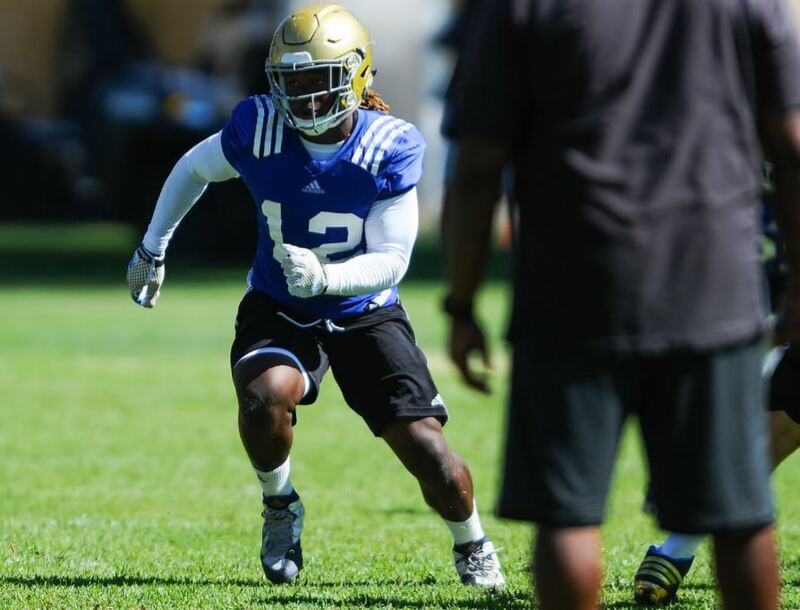 Although defensive end Takkarist McKinley came up short of his promised 4.4-second 40-yard dash at the NFL Combine, the former Bruin still was one of the star sprinters for his position on Sunday. McKinley officially clocked in at 4.59 seconds for his 40, which placed him third among defensive linemen during Sunday’s on-field workouts in Indianapolis. He participated in workouts despite an injured shoulder, which will require shoulder Monday. He told reporters Saturday that he played through the injury for two years at UCLA. Even with the injury, he got 24 bench press reps. Despite testing well, McKinley faltered on some drills, making mistakes while at times guessing which direction to go. UCLA has five players participating in this week’s NFL combine, which starts Tuesday and ends March 6. Linebacker Jayon Brown, defensive linemen Eddie Vanderdoes and Takkarist McKinley, offensive lineman Conor McDermott and defensive back Fabian Moreau will go through the biggest job interviews of their football careers so far in Indianapolis. The group of former Bruins, along with more than 300 other prospects, will go through formal interviews with teams as well as on-field workouts prior to April’s NFL draft. From the San Jose Mercury News: NFL Network’s Mike Maycock told reporters that the Oakland Raiders might be keeping a close eye on Vanderdoes at the combine. After leading the Pac-12 in tackles as a senior, linebacker Jayon Brown signed with agent Leigh Steinberg to begin his road the NFL draft. Steinberg, the inspiration for the movie “Jerry Maguire” who is rebuilding his career after a fight with alcoholism, had a first-round pick in quarterback Paxton Lynch in last year’s draft. Brown will train at Athletic Republic in Santa Ana to prepare for the combine and draft. He has also accepted an invitation to play in the East-West Shrine Game on Jan. 21. Defensive tackle Eddie Vanderdoes, who declared for the NFL draft early, has already left school to start his training. He tweeted that he was bound for EXOS, the Arizona-based facility where several previous UCLA draft picks have trained, including Myles Jack and Caleb Benenoch. Linebacker Jayon Brown, defensive end Takkarist McKinley and center Scott Quessenberry added AP first-team All-Pac-12 selections to their postseason award hauls on Friday. UCLA’s pair of defensive stars were unanimous first-team selections. The trio of players also earned All-Pac-12 first team honors as voted by the conference’s coaches while Brown and McKinley were also first-team all-conference selections by Pro Football Focus and ESPN.com. Tight end Nate Iese was named to AP’s All-Pac-12 second team. Iese, who was voted second team All-Pac-12 by the coaches, was third on the team with 25 receptions and 400 receiving yards for four touchdowns in his first year at tight end.